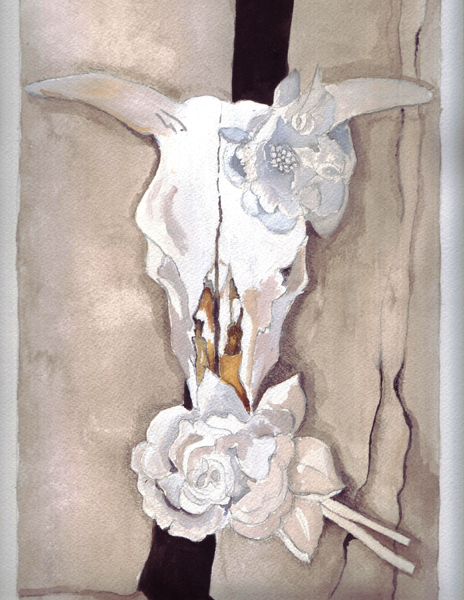 I selected the oil painting named Cow Skull and Two Calico Roses to copy - converting it to watercolor which is my chosen medium. During this class I watch our art teacher of the week paint a copy of her chosen Master, and then look at many images of our Master artist's work (in books and online) and select one that speaks to me. I need to then think about how I will transform an oil painting into one done in watercolor. I selected this O'Keeffee painting from a book of 100 flowers by O'Keeffe - and because I was working so big I added a few grid lines to the illustration so I could draw it on my watercolor paper and approximate the original size and shape. The 4 X 4 grid lines are visible here. The illustration has a glossy surface and the colors were washed out a little in the photo. I wanted to use titanium white gouache to get more experience using it for shades of white - and used it mixed with watercolor for white areas of the skull and both flowers. The background and the colored areas of the skull were painted with watercolors. Here is my finished painting - photographed with my cell phone. And here it is scanned on a flat bed scanner that is made only for 8.5 X 11 inch paper. This is the end of "Botticelli week" with apprentice/artist Jenny Lee Wentworth. I had to reflect back on what I learned from painting a Botticelli woman from a Rennaisance fresco and it is now time to use Botticelli's techniques in my own composition. 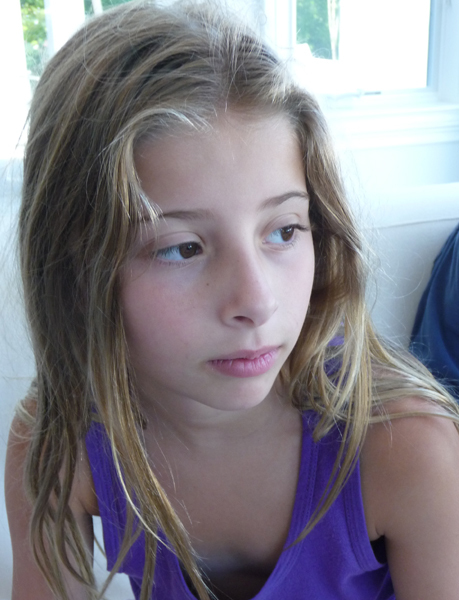 I wanted to do a portrait and to select an image that showed serenity, much like Botticelli's women, and I finally selected a candid photo of my 9 year old grand daughter Sydney for my inspiration. I have sketched her before and can never achieve a true likeness, but her photo was for inspiration - not for a portrait of her. 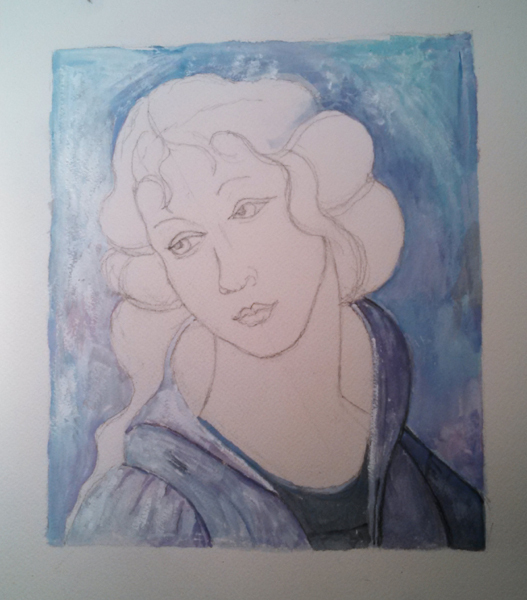 I used watercolor and titanium white gouache for the background, like I did with my copy of Botticelli's "Grace" in the last blog post. The rest of the painting was done with Winsor Newton watercolors. Botticelli's painting of hair is very distinctive and and I used a partial layer of yellow ochre, then a mixture of neutral tint and Van Dyke brown, and then Van Dyke Brown alone to add a few more golden highlights. The skin is a palette mixture of yellow ochre, permanent alizarin crimson, with a dab of Payne's Gray. I work with 3 triads on my watercolor palette - a warm red, blue, yellow, a cool red, blue, yellow, and a "Velasquez triad" - of yellow ochre, burnt sienna, and Payne's gray. And over the years I added just a few convenience colors like the Van Dyke brown and neutral tint. These 9 primaries really allow me to mix any color I want right on my palette, which I love to do! Here is the photo of Sydney who was 8 years old when it was taken in August 2013. I used it for inspiration for my Botticelli woman and although I tried, I didn't really capture her in a realistic portrait. I get slightly closer over time, but not close enough. This morning I started to watch the videos for Danielle Donaldson's Week 5 studying Georgia O'Keeffe. This is Week 4 of my online course and I'm still loving it. This week mixed-media artist Jenny Wentworth was apprenticed to Sandro Botticelli. After watching videos about Botticelli, his techniques and paintings, Jenny painting two compositions - one to teach us about egg tempera, and the other using acrylic paints. I selected the Botticelli that I wanted to copy - A Woman Receiving a Gift From Venus and Three Graces. This was a fresco from Villa Lemmi near Florence and the villa was owned by Giovanni Tornabuoni who was the uncle of Lorenzo Medici. The fresco was discovered in 1873 under a layer of white wash - and was removed, transferred to canvas, and installed in the Louvre. I selected one of the graces for my painting. Here is my copy of the original - without the cracks in the fresco. This is a watercolor, in which I added Titanium white gouache to do the textured painting in the background and on her robe. I'd never used this technique, but loved the different quality of the opaque-watercolor tinted gouache. 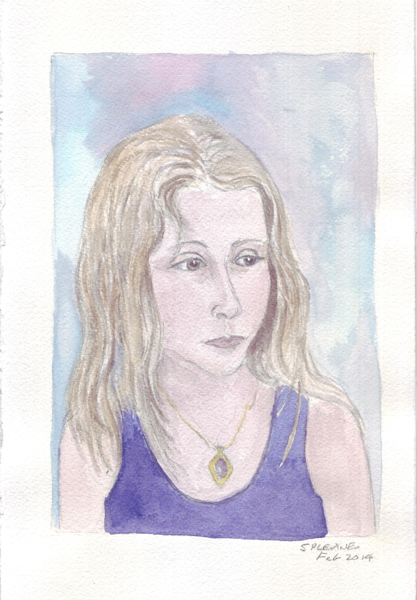 The face and hair were painted with watercolor, without added gouache. I used 10 X 14" Arches 140 lb Cold Press paper, Winsor-Newton watercolors, and Schminke Titanium White Gouache. We are encouraged to take periodic photos of our painting, in progress, but I regularly forget. This time I forgot to take a photo of the drawing, but then took a few intermediate photos with my cell phone. 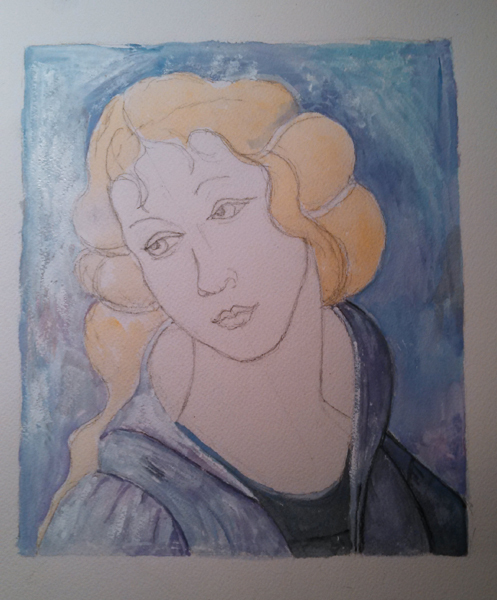 Stage 2 - After adding an underpainting for her hair with yellow ochre. Stage 3 - After painting the face, neck and underpainting the inside of the robe color. 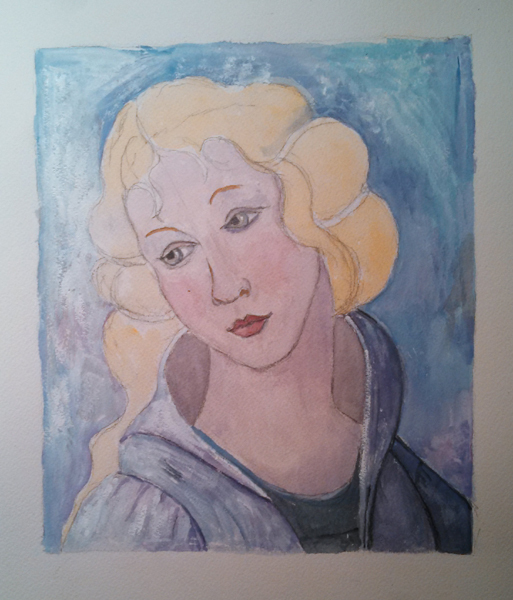 Next I need to watch more videos and then do my own composition in the style of Botticelli. Each week of the this class, or with each Master Artist, we are encouraged to do at least one copy and then to try to apply techniques that we learned to our own art composition. This was a personal challenge project to try to work on some compositions repetitively. 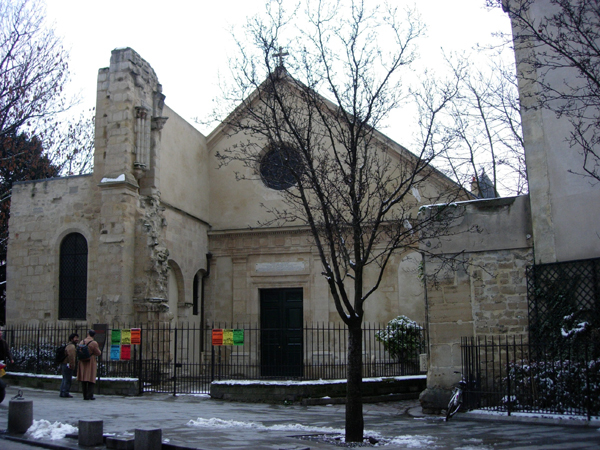 The painting that I copied for this course, Ginger Jar and Fruit, was a still life, so I searched through my Paris photos and found this church which I photographed on the way back from an exhibit at the Henri Cartier Bresson exhibit. I don't know the name of the church. My goal now was to paint a landscape with architecture, to simplify the composition, to use an underpainting (except for the sky), and to use short brushstrokes to mix the watercolor pigments on the paper. Here is the reference photo - in the snow! 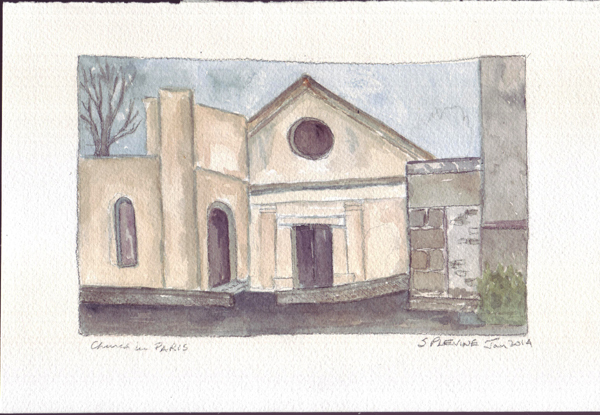 And here is my Cezanne-ish painting of the same subject. 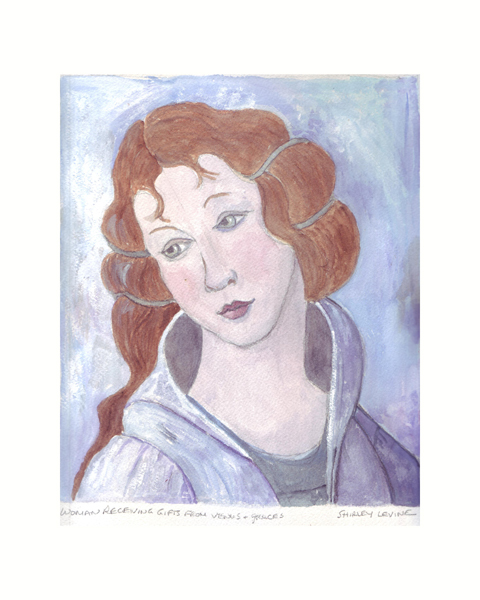 I really enjoyed Cezanne week, but today will move on with Jenny Lee Wentworth as she apprentices herself to Sandro Botticelli - one of the great early Renaissance painters. It is snowing again in NYC so I'm delighted that I will be comfy at home to start watching the videos. 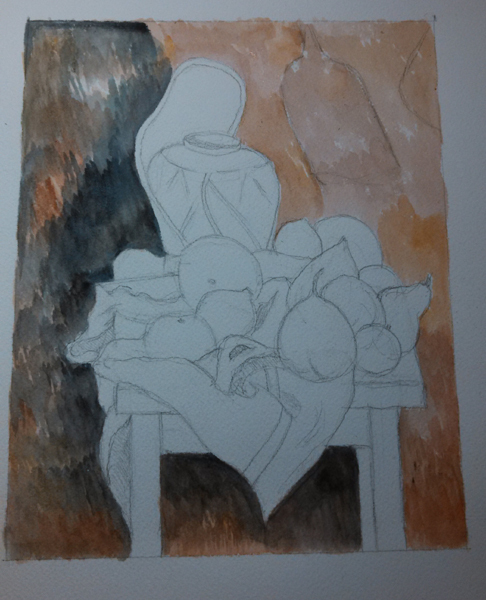 This is Week 3 of Studying Under the Masters and artist Terea Sheeley selected Cezanne as her Master. 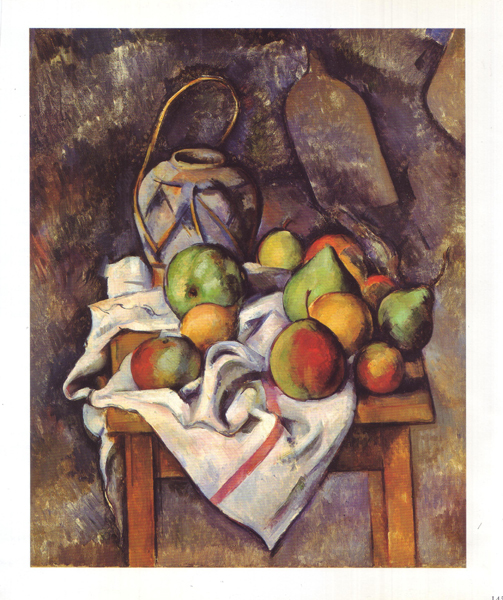 I watched almost 4 hours of video that she prepared, including her copy of one of his masterpieces in acrylic, and her original still life composition done in watercolor, in the style of Cezanne. 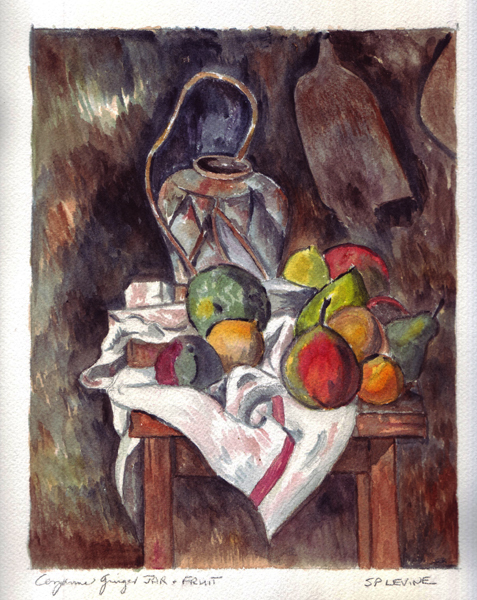 It took me awhile to make my choice among Cezanne's paintings, but finally decided to copy "Ginger Jar with Fruit" which he did in oils, but I wanted to paint in watercolor. This is a painting from the Barnes Collection - and I must have seen it in the new Barnes Museum in Philadelphia last year - among the 69 Cezannes that he collected. I finally had to stop "fiddling" because there are areas that still need some dark lines. I always remember that it is hardest to know when to stop and I decided this might be it. While watching Teresa, I learned lots about the very short brushstrokes that Cezanne used, and this painting of his is a great example of that. It forced me to do many things - work big (a 6 X 9" painting on large sheets of Arches CP 140 lb paper), to use an underpainting also with short brushstrokes, to work with a drier brush, and to limit my palette. 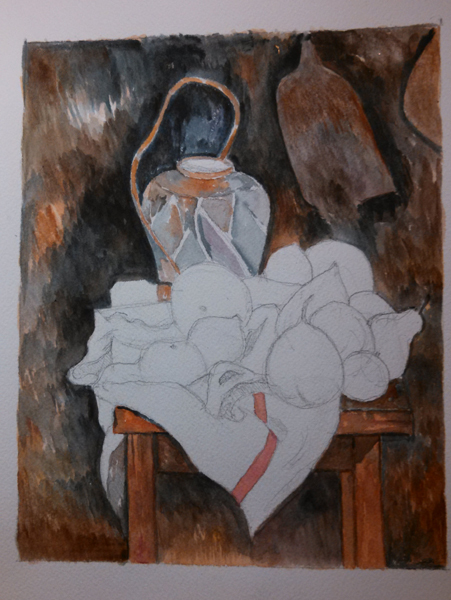 I used Yellow Ochre, Van Dyke Brown, Burnt Sienna, Payne's Gray, Neutral Tint, and Ivory Black for the background. I also used an occasional dab of my cool and warm primaries -yellows and reds and blues - for the fruit. During Matisse week Jeanne Oliver decided that it was important to take many photos of work in progress, like Matisse. I took 6 - and here are 3 of my photos - taken with my Android phone while sitting on my comfy couch. 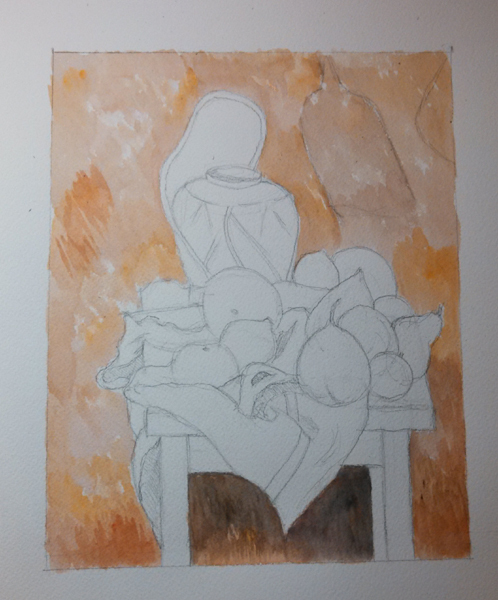 I now need to apply what I learned about Cezanne to my own composition and will try to finish that before Monday morning when the next artist is posted. 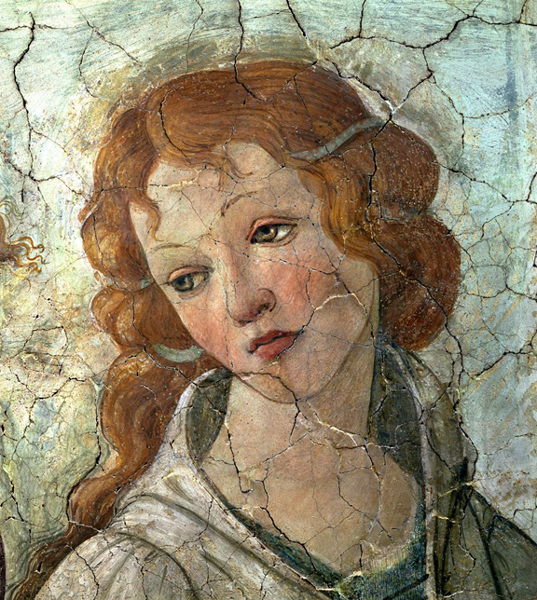 Next Week is artist Jenny Wentworth studying under Sandro Botticelli. There is still time to enroll in this class. It costs $62 for 9 weeks of instruction with 9 different artists, and the class will remain on line for 2 years. I'm choosing to do one artist per week, but many of my fellow classmates are planning on one artist per month. The only thing you will miss is participation in a live chat - but I missed all of them and just read the transcript. You can learn more by going to Jeanne Oliver's website and clicking on Studying Under the Masters.